This segment brings you our unbiased ratings of Expert Option. We assess and rate the competencies of the company on a scale of 1 to 100 to make it easy for you to see at a glance how well the firm performs in these areas. Expert Option’s bonus offers are excellent, as the company prioritizes bonuses and rewards to enable it to incentivize potential clients to open an account and deposit with them. Bonus percentages range from 50% to 125%, and is given out on the basis of account type operated by the trader. The conditions for accessing the rewards are more lenient than with other brokers. This area is arguably the platform’s strongest performance point, hence the 95/100 score. Also, Expert Options scores well on the customer care front because the client support team has mastered how to wow clients by interacting with them on a daily basis. They have made a habit of using positive language and boast a calming presence, all while passing across helpful information. The choice of trading instruments offered by Expert Option is excellent. The company did well to ensure that it provides some of the most tradable assets available in the financial markets today. The software works well and delivers features that help make trading a fun experience for users across all account types. As such, it deservingly gets a 77/100 rating from us. With so many companies offering binary options brokerage services, Expert Option has done well to distinguish itself by building a reputation that has helped make it an excellent choice for traders seeking for a trustworthy broker. You would probably want to find out what makes them stand out. This review informs about how they stack up against the rest of the players in the industry. Expert Option is a binary options broker established in 2015. The company is based in St Vincent and the Grenadines and is licensed by the Financial Market Relations Regulation Center (FMRRC) with license number TSRF RU 0395 AA Vv0084. It is also regulated and authorized by the Vanuatu Financial Service Commission (VFSC) under license number 15014. Expert Option accepts traders from 150 countries. However, it does not provide services to citizens and residents of countries such as Canada, USA, Switzerland, New Zealand, Israel, Puerto Rico, Japan, Sudan, North Korea, Australia, and those in the European Economic Zone. The platform provides social trading on all devices including Windows, Mac OS, Android, and iOS. Traders on the Expert Option platform get exciting bonus offers. A trader’s account type determines the number of bonuses they are eligible for. That is, the more deposits you make, the more bonuses that you will be provided. In this manner, Mini Account owners are awarded 50% match deposit bonus, while Silver Account owners get 80%. Moving further up the rung, Gold Account operators are granted 100% bonus, while VIP Account holders are given 125% match bonus. The VIP account also comes with lots of perks such as excellent account management options and fast withdrawals. Similarly, Expert Option offers existing traders a re-deposit bonus scheme, which is designed to encourage them to renew their commitment to the platform by depositing more funds. The re-deposit bonus begins at 25%. Increase in the deposit amount will see the percentage increase further. All bonuses hinge on turnover requirements before any withdrawals can be processed. Expert Option has one of the most advanced mobile trading platforms on the market. So efficient is the system that it enables traders to execute trades within seconds. The mobile trading platform is offered as a downloadable app and is available on the various mobile marketplaces such as The Android Play Store and the Apple App Store. Traders who wish to trade on the go will find the software very useful, due to a collection of full-featured trading functionalities that allows them to take all of their favorite trading features wherever they go. Those who do not wish to download the software onto their mobile devices can access the web platform on their smartphones or tablets. The option combines the convenience of mobile trading and the sophistication of web trading to deliver essential trading tools at your fingertips. » Credit/Debit Cards. Expert Option allows you to deposit or get your funds easily via card options like VISA and MasterCard. » Wire Transfer. Traders who prefer to wire funds to domiciliary accounts can do so, as Expert Option supports wire transfer method. » E-Wallet. Individuals on the Expert Option trading system can send and receive funds via Neteller, Skrill, Webmoney, and PayPal. » Phone: Expert Option’s dedicated phone number is +44 20 3868 3160. » Also, traders can contact support via a live chat facility. All channels are available 24/7, 5 days a week. » Demo account. Expert Option provides unlimited demo account for traders on all platforms. This provides an excellent avenue for traders to evaluate the performance of the system and trading accounts before settling for them. » Expert Option offers a fully functional educational suite that contains a delightful compilation of binary trading strategies and technical analysis. » The platform offers an affiliate program that lets traders refer their friends and earn a referral bonus. » Asset Schedule. This feature helps ensure that you do not have to be in front of your screen all day long. It shows the best trading times for each of your listed assets. This helps make for an efficient trading experience, as you can program your schedule to trade just when your preferred asset is up for trading. 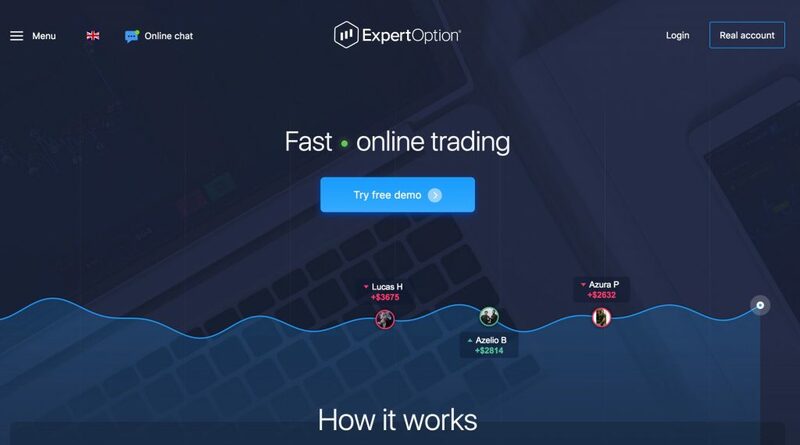 » Expert Option provides a social trading feature that lets traders watch trades and follow events in the markets across the globe. » The system offers a broad range of asset portfolio. » Great matching deposit and re-deposit bonus programs provide additional incentives to traders. » It provides several analysis tools, including trend lines, 4 chart types, and 8 indicators. » The platform is available for all devices. » Short trading duration. A maximum of 15 minutes’ trade duration limits the amount a trader can generate in profits, especially when the opportunity to gain presents itself. » Expert Option is being regulated by some of the lesser regulatory agencies in the financial industry. This leaves room for doubts and reluctance on the part of traders. What is the minimum deposit amount on the Expert Option platform? The minimum deposit allowed on the Expert Option platform depends on the type of account being operated. The Mini Account has a minimum deposit of $50; Silver Account, $250; Gold Account, $1,000; and VIP Account, $2,500. Expert Option is a legitimate broker. So far, there are no scam reports about the firm. Yes, Expert Option is regulated in two jurisdictions by the Financial Market Relations Regulation Center (FMRRC) and Vanuatu Financial Service Commission (VFSC). Is mobile trading available on Expert Option? Yes, Expert Option provides a functional mobile trading platform.